Trump’s Cavalry Expands Oil & Gas Leasing in the Gulf of Mexico | Watts Up With That? Edit: The title has been changed because after giving it some thought, I decided that it could be construed as misleading. Old title: Trump’s Cavalry Opens Entire Gulf of Mexico to Oil & Gas Leasing! WASHINGTON – U.S. Secretary of the Interior Ryan Zinke today announced that the Department will offer 73 million acres offshore Texas, Louisiana, Mississippi, Alabama, and Florida for oil and gas exploration and development. The proposed region-wide lease sale scheduled for August 16, 2017 would include all available unleased areas in federal waters of the Gulf of Mexico. Proposed Lease Sale 249, scheduled to be livestreamed from New Orleans, will be the first offshore sale under the new Outer Continental Shelf Oil and Gas Leasing Program for 2017-2022 (Five Year Program). Under this new program, ten region-wide lease sales are scheduled for the Gulf, where the resource potential and industry interest are high, and oil and gas infrastructure is well established. Two Gulf lease sales will be held each year and include all available blocks in the combined Western, Central, and Eastern Gulf of Mexico Planning Areas. The estimated amount of resources projected to be developed as a result of the proposed region-wide lease sale ranges from 0.211 to 1.118 billion barrels of oil and from 0.547 to 4.424 trillion cubic feet of gas. The sale could potentially result in 1.2 to 4.2 percent of the forecasted cumulative OCS oil and gas activity in the Gulf of Mexico. Most of the activity (up to 83% of future production) of the proposed lease sale is expected to occur in the Central Planning Area. Most of the Alaska OCS is no longer green. 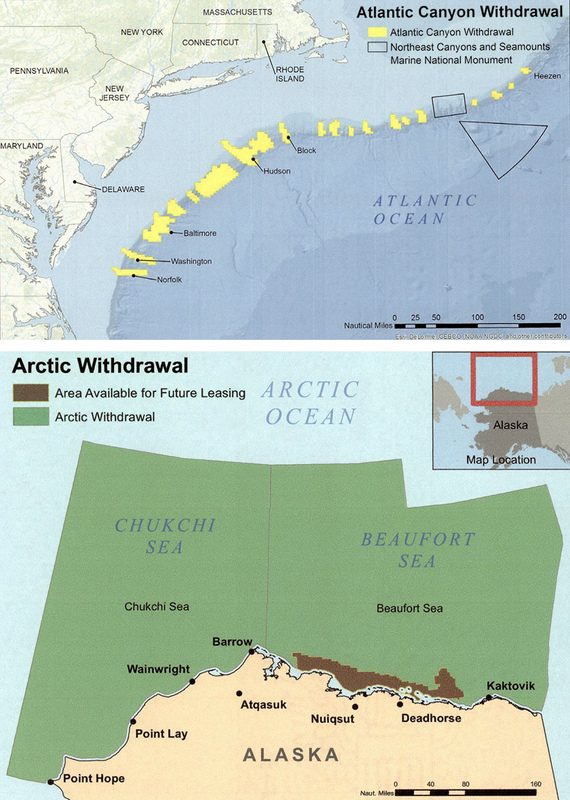 In December 2016, Obama prohibited new leasing in the Chukchi Sea and most of the Beaufort Sea areas. While this is a step in the right direction, Trump has a long way to go. The Trump administration on Monday announced an offshore oil and gas drilling proposal in the Gulf of Mexico that appears to mirror a plan offered by his predecessor a few months ago. In one of his first acts after last week’s Senate confirmation, Interior Secretary Ryan Zinke proposed leasing 73 million acres off Florida, Alabama, Texas, Louisiana and Mississippi over five years starting in August. The offer includes more than 13,700 lease blocks extending three miles to 230 miles offshore, according to an Interior Department statement. But the plan is similar to a five-year proposal by the Obama administration to lease 66 million acres in the same location, the gulf’s “Western, Central and Eastern planning areas” where water is as shallow as nine feet and as deep as 11,000 feet. As he prepared to leave office, President Obama banned drilling in the Arctic and Atlantic oceans for the next five years, but allowed it in the gulf with lease plans offered primarily off gulf states other than Florida. Obama’s interior secretary, Sally Jewell, said the proposal’s leases were focused “in the best places — those with the highest resource potential, lowest conflict and established infrastructure — and removes regions that are simply not right to lease.” The gulf, an area that has seen intense drilling, would see more compared with the Arctic and Atlantic, where little drilling occurs. The gulf, an area that has seen intense drilling, would see more compared with the Arctic and Atlantic, where little drilling occurs. Areas that have been generally off limits to drilling or subject to intense regulatory malfeasance would tend to see little drilling. I almost attributed this idiotic statement to former Interior Secretary Sally Jewell, before I noticed it wasn’t in quotes. So… An article which dishonestly claims that 73 million acres “looks a lot like” 66 million acres, chooses photos of two extremely rare drilling and production disasters to accompany an article about lease sales. Of the nearly 53,000 wells drilled in the US Federal waters of the Gulf of Mexico since 1947, there has been exactly one accident of the Deepawater Horizon’s magnitude and very few others that even come close. That’s 570,446,881 measured depth feet of drilling, 108,039 miles. “From 1 January 1980 through 31 December 2012” there were 196 “blowouts/well releases” in the US Gulf of Mexico. 32,132 wells were drilled during that same time period. That is a 0.6% well control incident rate. 99.4% of the wells were drilled without well control incidents. And The Washington Post chose to accompany this article with two of the worst well control incidents in recent history??? Haven’t OCS operations historically spilled a great deal of oil? No. Since 1980, OCS operators have produced 4.7 billion barrels (bbl) of oil and spilled only 0.001 percent of this oil, or 1 bbl for every 81,000 bbl produced. In the last 15 years, there have been no spills greater than 1,000 bbl from an OCS platform or drilling rig. The spill risk related to a diesel spill from drilling operations is even less. During the 10-year period (1976-1985) in which data were collected, there were 80 reported diesel spills greater than one barrel associated with drilling activities, compared with 11,944 wells drilled, or a 0.7 percent probability of occurrence. For diesel spills greater than 50 bbls, only 15 spills have occurred, or a 0.1 percent probability. Natural seepage of oil in the Gulf of Mexico (unrelated to natural gas and oil industry operations) is far more extensive. 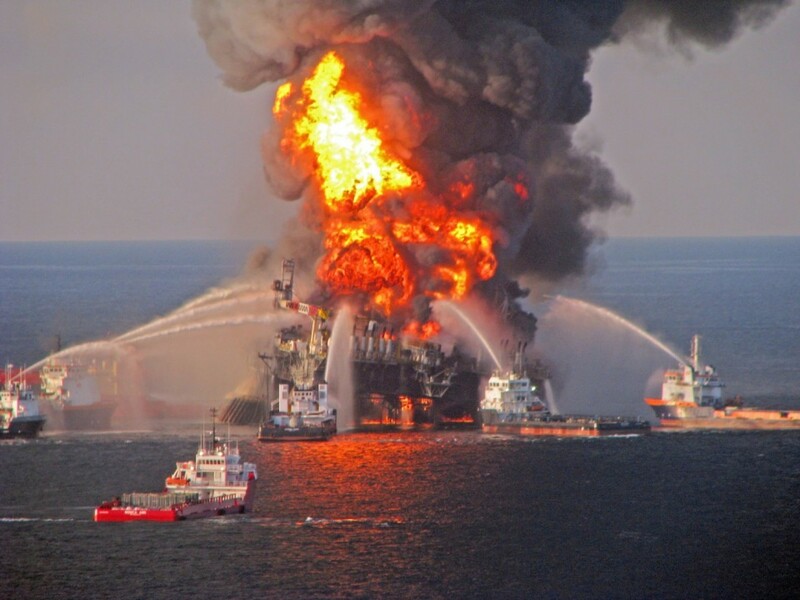 Researchers have estimated a natural seepage rate of about 120,000 bbl per year from one area (23,000 square kilometers) offshore of Louisiana. Needless to say, this disappeared from the MMS (now BOEM) website shortly after the Deepwater Horizon blowout. Featured image: Interior Secretary Ryan Zinke rides a horse to work. Are green heads exploding yet? They sure are in CA I bet. I wonder if Moonbeam Brown will try to block this off the coast of “his” state? For some reason that old video of children being blown up because they didn’t agree with the alarmists came to mind. From what I can see, either the borg has not yet sent out the order for exploding heads – or they’ve already exploded and have stopped commenting. Forgot to say that IXTOC was in the Gulf, but not in US Federal waters. Furthermore, the Ixtoc spill was caused by the failure of a blowout preventer. 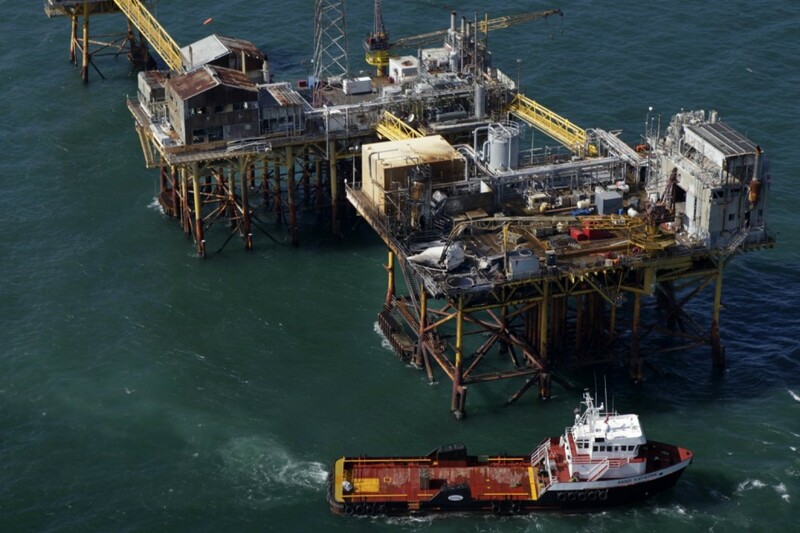 Like Deepwater Horizon, the leak persisted for 9 months until two relief wells could be dug. It was also similar in size: 3 million barrels vs 4.9 million barrels. Oil drilling is an inherently risky operation. Is the inherent risk in such operations suggest that these events will occur about once a decade or less than once a century? Unfortunately, the Obama Administration issued new rules and regulations (expensive) before the blowout preventer was recovered and its failure understood. In the case of IXTOC, I think the BOP was improperly installed. The Washington Post did not say the plan was identical. It said it looked “a lot like”. And 66 and 73 in my book are somewhere between “similar” and “a lot like”. Surely you can make an strong argument without misrepresenting other’s statements or needing to set up a straw man. 73 million acres is not identical to 66 million acres… Particularly when the 7 million new acres have been off limits for many years. And the new program will offer all available leases in the Western, Central and Eastern Gulf in two annual area-wide sales, rather than single annual individual planning area sales. 73 million acres does not look a lot like 66 million acres, particularly when the 7 million acre difference has been off limits for a while. Easter Gulf? Seaweed for Easter grass. Crab pots for Easter baskets. so it is substantially different from Obama’s plan – this one?? It’s totally different and the McClatchy article was more dishonest than the Washington Post. This article is about the 2016 Central Gulf sale. It dishonestly states that the Fed’s will “open 45 million more acres in Gulf for energy development.” Those 45 million acres and most of the rest of the Central Gulf have been open for decades. The old leasing plan featured 1 Central Gulf sale in March, 1 Western Gulf sale in August and an occasional Eastern Gulf sale. The new plan will offer all available leases in all three planning areas in two annual sales. The old plan included 66 million acres spread across three annual area-specific sales. The new plan includes 73 million acres in two area-wide annual sales. The new plan doesn’t open up the entire Eastern Gulf; but it does open up some new acreage and it gives the industry two annual shots at bidding on all available acreage, rather than one, Much of the Eastern Gulf within 125 miles of the Florida coast will remain off limits until at least 2022. I wonder if Griff actually read the article he’s citing this time? In fairness to Griff, most people are unclear on the Gulf of Mexico leasing process. I probably should have included a detailed discussion of the process… But that would have made for tedious reading. The only energy policy that can work is Sarah Palin’s policy: “Drill Here, Drill Now, Drill Everywhere.” All of the energy progress we have seen in the US has come from drilling. Disagree. We should have Liquid Fluoride Thorium Reactors instead. Nuclear has a million times the energy density of a carbon-hydrogen bond. I don’t know why people here keep pushing oil and gas. And I say that even though most of my retirement portfolio is Exxon stock. These reactors are doable now. The Fabian socialists should rejoice with all the federal revenue coming in to the treasury. And that is lease sale alone never mind royalties. Yet another example of Trump following through on campaign promises. I am pleasantly suprised. Next, undo the West and East Coast moratoriums? I’m sure the additional revenue from the leases will mean lower taxes. Sure. Perhaps not, but it should help fund much of the very needed infrastructure maintenance, repair, and improvment. America is 18 Trillion ( 18,000,000,000,000) dollars in debt. You could use an infusion of cash , just to service the dinterest on the loans, not to mention the principal. And issuing $18 trillion in bills of credit would cancel it tomorrow. Same thing Lincoln did during the civil war when he couldn’t borrow and we didn’t have an income tax. He issued bills of credit called greenbacks. $450 million at the time. Won the civil war with them. Bills of credit are basically tax credits that circulate. This mean no march against and a Hollywood scientist applause? A good reason for agreeing that it is similar to Obama’s plan! Additional revenue may not lower taxes but the additional jobs, the jobs’ associated tax revenue, the lowered energy costs and the kick to local and state economies will lead to lowered taxes. And increased happiness. Making Liquid Fluoride Thorium reactors would do us far more good. Somebody tell Trump and Tillerson. What is the expected sales proceeds from these auctions? It can vary widely depending on oil & gas prices, lease turnover and whether or not new leases are included. But, but but, won’t someone PLEASE think of the CHILDREN! Trump knows the children will need access to cheap reliable energy! Hmmm… so this doesn’t follow the previous economic model. Inhibit economic activity creating dependency resulting in power and gravy for yourself. This looks more like let it roll free the people stuff. We like that. If the WaPo pans it, it must be good! That is the way to bet. ut – “If the WaPo pans it, it must be good!” – for sure! Thanks David. This is fantastic news as you say. The Obungler caused oil production to fall on BLM and Gulf lands while production doubled on private lands. This is a great turnaround. Now production will grow on Federal Lands and offshore too. The reining in of the EPA thugs is welcome news as well. The future is bright. It as lot like when an article on climate alarmism starts off with a picture of factory billowing white smoke. CO2 is colorless. The white smoke is water vapor, but probably a lot of people don’t know that and think the white smoke is CO2 pollution, another absurd claim by the EPA. The Progressive Left is giving progress a bad name. Notice too, sometimes the photo has a low sun background making the water vapor look as black as high density PM2.5. I am part of the Progressive left and I want Liquid Fluoride Thorium Reactors. That is progress. 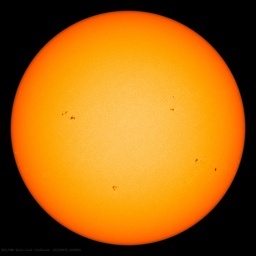 A million times the energy density is progress. Jose, it seems obvious that English is not your first language. Perhaps you should seek some help in translation?